The Spanish coach has emerged as the frontrunner to replace Carlo Ancelotti. Rafael Benitez coach will leave Napoli at the end of the season. RAFAEL BENITEZ HAS confirmed that he will leave Serie A club Napoli at at the end of the season. Benitez has emerged as the frontrunner to replace Carlo Ancelotti at Real Madrid and the 55-year-old stated he will end his two-year stay at a news conference on Thursday. The former Liverpool manager will take charge of the Naples club for the final time on Sunday, when they take on Lazio knowing a win will secure a UEFA Champions League spot at the expense of their opponents. 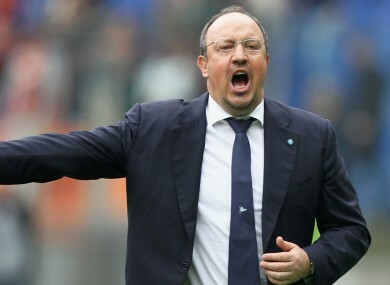 “I thank the president (Aurelio De Laurentiis), the company and all the fans because after two years I am ending my experience here in Naples.” said Benitez. “It is always sad to leave a place where people treat you well from the start, so it was in Naples. Email “Rafa Benitez is a step closer to one of the most coveted jobs in football”. Feedback on “Rafa Benitez is a step closer to one of the most coveted jobs in football”.